In order to evaluate potential correlations between VTA GABA neurons and electrocortical activity, we studied electroencephalographic (EEG) activity in freely-behaving rats during different stages of their sleep-wake cycle. The cycles of sleep were determined by visual observation of the rat (supine posture, eyes closed, breathing slow), and by distinct patterns of EEG activity. For example, during active wakefulness (AW), EEG activity was dominated by high frequency and low amplitude voltage activity, during slow-wave sleep (SWS) EEG activity consisted of low frequency and high amplitude voltage activity, and during rapid eye movement (REM) sleep EEG activity looked similar to AW, except REM was characterized by a distinct gamma frequency not present during AW. As previously demonstrated, VTA GABA neuron firing rate was relatively slow during SWS, and fast during AW and REM sleep. In fact, the firing frequency of VTA GABA neurons during REM (mean = 36 ± 3 Hz) was nearly identical to the gamma frequency peak (mean = 35 ± 2 Hz), suggesting that VTA GABA neuron activity contributes to, or is reflective of gamma EEG activity. To more conclusively determine if there is a direct correlation between VTA GABA neuron activity and gamma EEG activity we performed spike triggered EEG averaging (STA) analysis. As shown in Fig. 1, there was no correlation between VTA GABA neuron activity and gamma EEG activity. There was also no correlation between VTA GABA neuron activity and theta EEG activity induced by tail pinch. To assure ourselves that the analysis was done correctly, we studied the well-known correlation between hippocampal GABA interneuron activity and hippocampal theta rhythm. The presence of oscillating peaks at approximately 5 Hz on the STA correlogram indicated that there was a direct correlation between hippocampal GABA interneuron activity and theta rhythm. This served as a positive control for our STA analysis. We recorded 4 VTA GABA neurons in freely-behaving rats and did not see any correlation between their activity and gamma EEG rhythms. In order to evaluate the effects of anesthesia on electrical coupling between VTA GABA neurons we studied the effects of the general anesthetic, and known gap junction blocker, halothane on electrical coupling between VTA GABA neurons. Coupling between VTA GABA neurons was produced by stimulation of the internal capsule. It has since become obvious that the GJ blocker halothane has effects on VTA GABA neuron coupling as well. Therefore, we studied the effects of the GJ blocker halothane on VTA GABA neuron post-stimulus discharges produced by stimulation of internal capsule (ICPSDs) in freely-behaving rats. Halothane significantly decreased VTA GABA neuron ICPSDs at doses greater than 0.5% with an IC50 of 1%, compared to control unanesthetized conditions (P<0.0001, t(2,7)=10.2; mean 50% maximum unanesthetized ICPSDs = 139 ± 5.2; Fig. 2). At issue here is the physiological relevancy of these artificially-induced responses. Would afferent input to VTA GABA neurons ever reach this critical level to induce discharges? In answer to this, we have observed spontaneous discharges in vivo (Fig.3). Unfortunately, to date, we have not been able to determine what consistently elicits this spontaneous behavior of VTA GABA have observed that the frequency of occurrence of paroxysmal discharging increases during transitions from anesthesia. 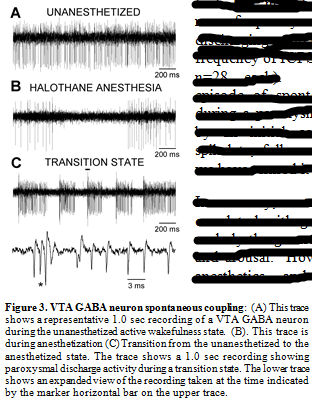 As previously demonstrated, VTA GABA neuron firing rate is slowed by select anesthetics, and is modulated differentially during the sleep-wake cycle: Being relatively slow during slow-wave sleep, variable during active wakefulness, and fast during REM sleep (Lee et al., 2001). . VTA GABA neuron activity is slowed and rendered phasic by halothane anesthesia. During transitions from anesthesia VTA GABA neurons often evince paroxysmal activity characterizes by epochs of discharging with a frequency nearly identical to that of ICPSDs (frequency integrated over the first 100 ms of spike discharging; mean frequency of spontaneous spike discharging = 305 ± 8.4 Hz vs mean frequency of ICPSDs = 316 ± 9.3 Hz; n=28 each). Nonetheless, each episode of spontaneous discharging during a paroxysm was characterized by an initial complex burst, then spikelets, followed by high-frequency spiking. neurons; therefore, we have termed it “paroxysmal”. In summary, contrary to our hypothesis, VTA GABA neurons are not correlated with gamma EEG rhythms. Thus, it appears that they do underly the generation of this rhythm implicated in cortical activation and arousal. 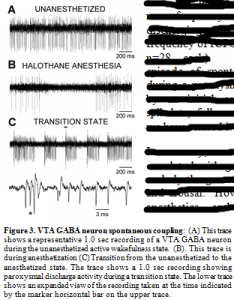 However, VTA GABA neuron coupling is sensitive to anesthetics, and they spontaneously couple during transitions between anesthesia and wakefulness suggesting that while discharge activity of VTA GABA neurons may not underly consciousness, the coupling between networks of electrically-coupled VTA GABA neurons may be implicated.